Here's a picture of me in my young and carefree days. I believe that it was taken in the MCC compound in Santa Cruz, Bolivia. 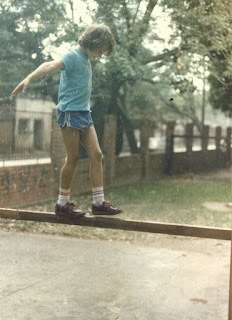 I liked to balance on and/or climb things. This past Memorial Day weekend I discovered that it was easier to climb trees when I was ten than now, when I'm almost 30. I now have bit more mass, and my joints aren't as forgiving when I land! On the plus side, I can now reach branches I wouldn't have been able to as a half-pint. I had a nice relaxing Sunday yesterday after being productive and canning 25 pints of salsa on Saturday with my friend Kevin. I finished reading Dorothy Sayer's Gaudy Night and even watched some tv.